ABSTRACT: Analyses based on complete faunas are more reliable than those based on a few species. 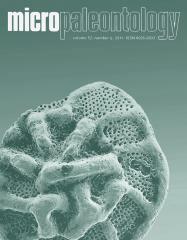 To minimize errors in identification due to geographical and ecological variations in skeletal morphology, as well as taxonomic “noiseâ€ caused by ontogenetic stages, the polycystine radiolarian fauna was grouped into 20 high-rank taxa (HRT); 12 Spumellaria and 8 Nassellaria families. Every region or local province has a characteristic “HRT-assemblageâ€ on either the family/subfamily or the suborder/order level,with very specific quantitative ratios. The polycystine assemblages of theNorwegian fjords and theNorwegian Sea contain essentially the same set of species, but data on the HRT show differences between the offshore and fjord associations, and between the main fjords and their tributaries. We show herein that HRT can be used not only in the Norwegian Sea, but also in most of the climatic zones of the Pacific. We used 21 published surface sediment samples along longitude 175°E between latitudes 48°N and 14°S in the western Pacific Ocean, documenting the relationships between the modern distribution of radiolaria and the present oceanographic conditions. The low-rank and high-rank approaches gave nearly identical results for this data set. Factor analysis produced essentially the same four factors using low-rank and high-rank taxa, but with different eigenvalues. Temperature reconstruction based on the factor analysis of high-rank taxa was also successful.